Having already extolled the virtues of Radio Free Skaro, I thought that I should also give a little mention to another entertaining Who related podcast. 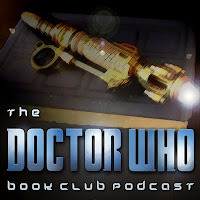 Having read many of the Target novelisations and quite a few of the Virgin New Adventures, the idea of a book related podcast really appealed to me. Your esteemed hosts, to guide you through the book chosen for each month are Sean from the fun and rather naughty Tardis Tavern podcast, and Erik, who is a contributor to Bridging The Rift. The guys do a great job in their roles as hosts, not only giving a critique of each book, but also deconstructing some of the more complex plot points that aren't always completely clear on first reading. One such example is Erik's explanation of the climax of Russell T Davies' Damaged Goods, which is a little tricky to follow, but he describes it well in a very concise and engaging way. I also like the way that the guys chat about their thoughts on each story, and they don't always agree on everything which makes for entertaining listening. They obviously put a lot of thought into their show, and you can tell that these two know their subject well. I like that they mix it up a little from month to month, by choosing stories that are different in tone, which helps to keep the show sounding fresh.